433-1390 Features: -Scale general store building. 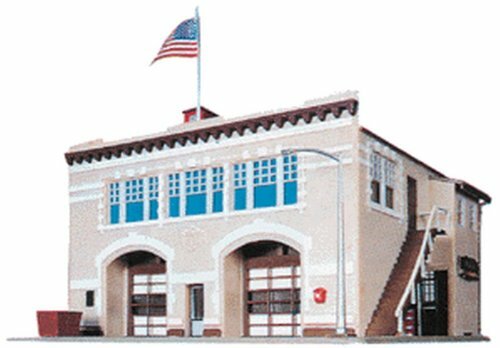 -Protecting lives and property around the clock, your local volunteer firefighters will be proud to have this building as their headquarters. 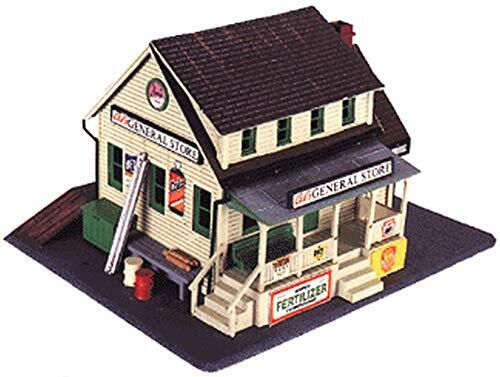 -HO scale building kit, model cement required. -Perfect in any town or country setting. Use: -Hobby. Product Type: -Scenery Buildings. Scale: -HO Scale. Material: -Plastic. Age Range: -12 Years And Up. Gender: -Boy/Girl. Color: -Multi-Colored. Dimensions: Overall Height - Top to Bottom: -10 Inches. Overall Width - Side to Side: -8.13 Inches. Overall Depth - Front to Back: -1.63 Inches. Overall Product Weight: -0.77 Pounds. Remember to buy bread and milk on the way home! A quick stop is easy when this neat supermarket is part of your city scene. It includes a full interior with cash registers, shelves and an ice machine, while there's a phone booth and a loading door for the exterior. HO scale An interesting addition to any shortline or branchline scene. Kit includes one of each: Line Shack (2 x 2-1/4" 5.1 x 5.9cm), Switchmans Shanty (1-5/8 x 2-1/8" 4 x 5.5cm) and Whistle Stop (2 x 2-1/4" 5.1 x 5.9cm). 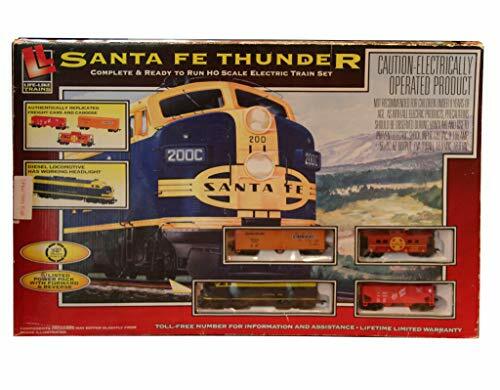 NOTE: Unless specifically indicated above, structure kits and built-ups do not include any pictured figures, vehicles, scenery, track, or trains. These are included in manufacturer provided images to demonstrate how the product may be used on your layout. 433-1351 Features: -Scale general store building. -You'll find everything from kerosene lamps to a friendly game of checkers at the general Store. -Lamps to a friendly game of checkers at the general store. 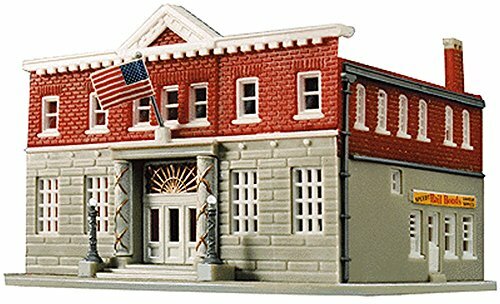 -HO scale building kit, model cement required. Use: -Hobby. Product Type: -Scenery Buildings. Scale: -HO Scale. Age Range: -12 Years And Up. Gender: -Boy/Girl. Color: -Multi-Colored. Dimensions: Overall Height - Top to Bottom: -9.38 Inches. Overall Width - Side to Side: -8.13 Inches. Overall Depth - Front to Back: -1.5 Inches. Overall Product Weight: -0.47 Pounds. Need a room for the day, week or month? Then check out this neat building for your downtown. Designed for easy construction, with plastic parts molded in realistic color. Includes roof-top sign, smoke jacks and window awnings. 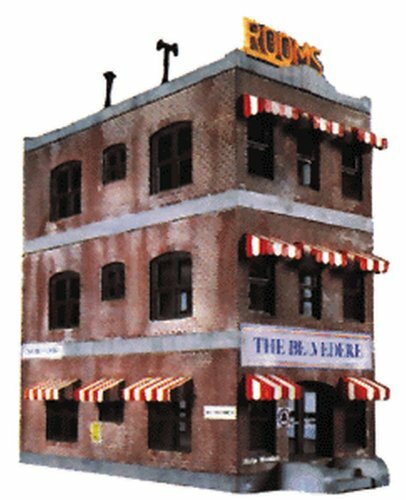 HO Scale Building Kit with illustrated instructions. Get things moooving on your railroad with this kit! Found in small towns and big cities, stockpens like these were used to rest and feed livestock traveling by train. Made of plastic, all parts snap-together for quick and easy construction and kits can be combined to make a bigger structure if desired. 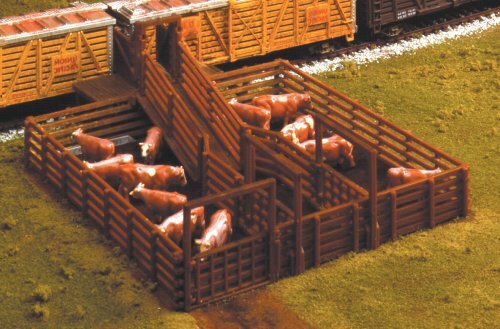 The parts are molded in brown and feature realistic wood grain detail, The gates and loading chute can be positioned, and there are 12 Hereford cattle for the finishing touch! NOTE: Unless specifically indicated above, structure kits and built-ups do not include any pictured figures, vehicles, scenery, track, or trains. These are included in manufacturer provided images to demonstrate how the product may be used on your layout. Perfect for layouts and for adding onto train sets, features include standard-profile easy-maintenance Code 100 nickel-silver rail, molded black plastic ties with realistic wood grain, joiners and holes to accommodate track nails. Remote-controlled turnouts come with a slide switch with momentary contact for simple wiring. The turnouts feature an 18" radius diverging route for maximum compatibility with popular Code 100 track systems. 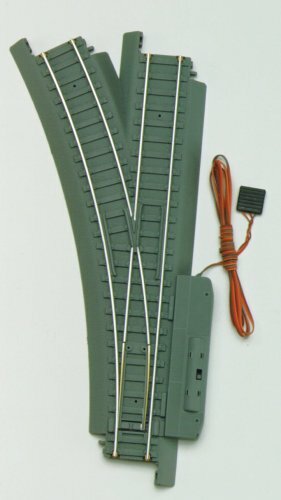 Turns any HO train set circle of track into a figure-eight up to 42 x 90" (1.06 x 2.2m). Includes four 9" straight tracks, four 6" straight tracks, six 18" radius curves and one 90 degree crossing section. 433-21303 Features: -Curved track.-4 piece of 18''stainless steel curved road bed train track.-Runs anywhere-carpets, floors or tables.-Fast and easy set up - no rail joiners.-Clicks together, locks together, stays together.-Perfect electric contact guaranteed.-Stainless steel. This is a brand new HO scale product. 2 LIFE-LIKE HO Slot Car Racing Dura-Loc 9" Straight Criss-Cross Track 9925 GLOW! 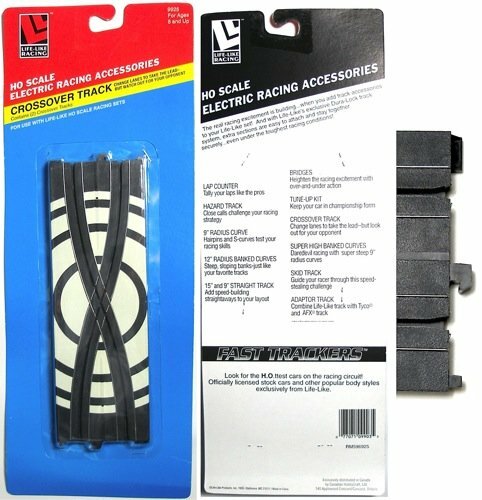 This listing is for TWO (2) pieces (one card) of 9" STRAIGHT CRISS-CROSS Tracks as shown, from LIFE-LIKE Racing. GLOW IN THE DARK MARKINGS! An easy way to even out most any racing layout giving inner & outer lanes similar challenges. Unused, Sealed on the card. EMD GP9M - standard DC Boston & Maine #1754 (blue, black, white). perfect diesel to power any HO train set . Get Your Train Up & Running in Less Than 5 Minutes. 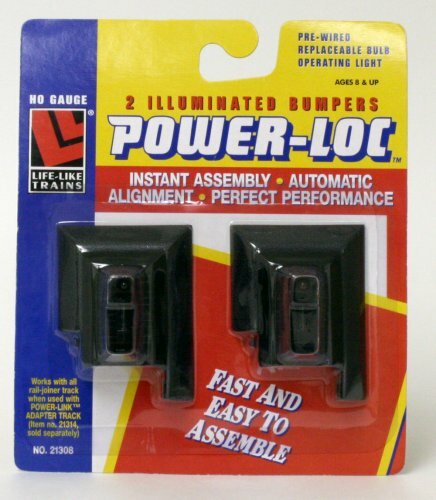 Power-Loc track guarantees instant assembly, automatic alignment and perfect performance. Its patented design eliminates pesky rail joiners, and its side-locking mechanism snaps together easily and quickly. 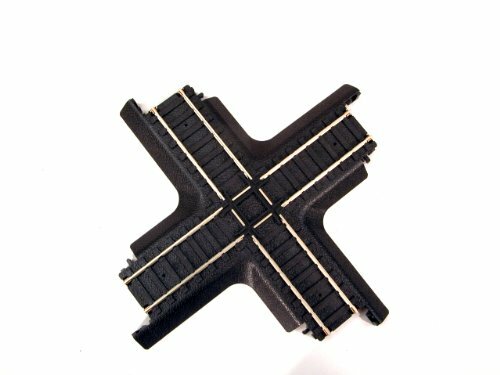 Power-Loc features a solid roadbed base so you can set up the track on many surfaces, including carpeting, eliminating the need for layout boards, nails, screws and other tools. 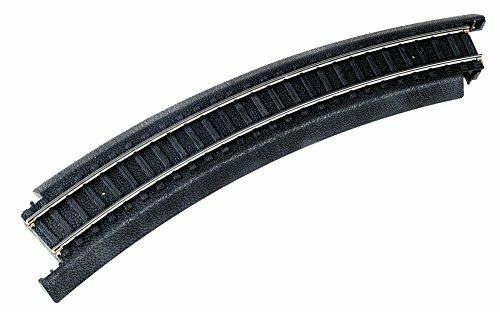 The track clicks together instantly, while its offset design makes the strongest track connection ever. The assembled track won't bend so you can p... [truncated].